Most triptychs were intended for use in places of worship, particularly as altarpieces. This one appears to have been commissioned primarily as a conversation piece for the well-educated nobility, specifically Count Henry III of Nassau-Breda (1483-1538), in what is now Belgium. 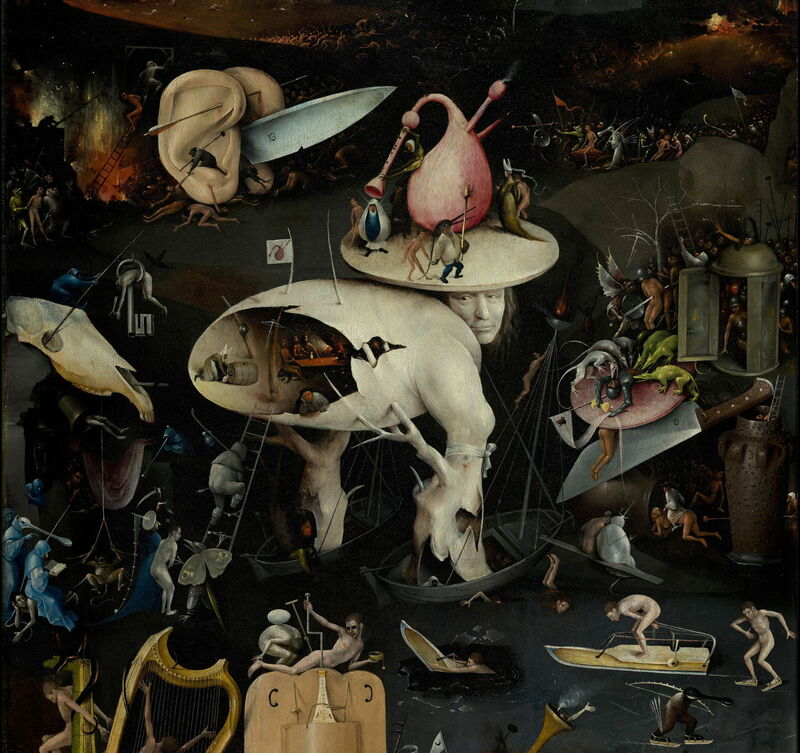 It is also one of Bosch’s best documented paintings, first being recorded only a year after his death, and described by a succession of viewers ever since. Ilsink et al. 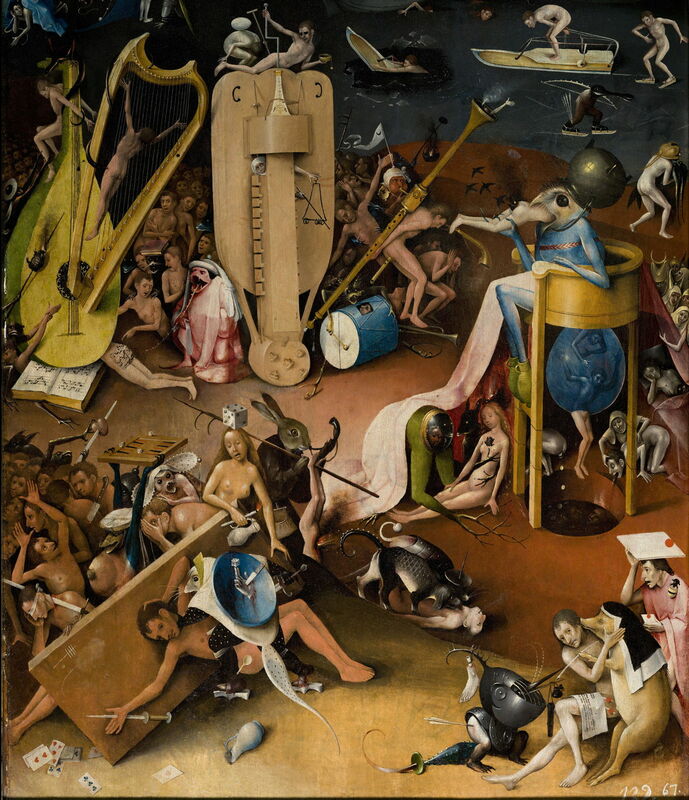 consider that Bosch’s main inspiration and source for the material in this painting was Hartmann Schedel’s extensively illustrated Weltchronik (history of the world) published in Nuremberg in 1493. This uses the same Biblical quotation as appears on the exterior of this painting. Despite those descriptions, extensive research, and many published studies since, it remains one of the most enigmatic paintings, with many different interpretations. Being so detailed, and with details which are so unusual, it is all too easy to get lost among its hundreds of cavorting figures and weird portmanteau objects. This account therefore starts at the top level, and this article does not delve into its rich details; those are covered in the second part. The exterior presents an understated grisaille showing the creation. The interior has three extraordinary panels showing fantastic landscapes which are quite densely covered with figures, real and fictional creatures, and bizarre structures. At first sight these may appear overwhelming, but on more careful examination each panel has a theme and its own pictorial structure. 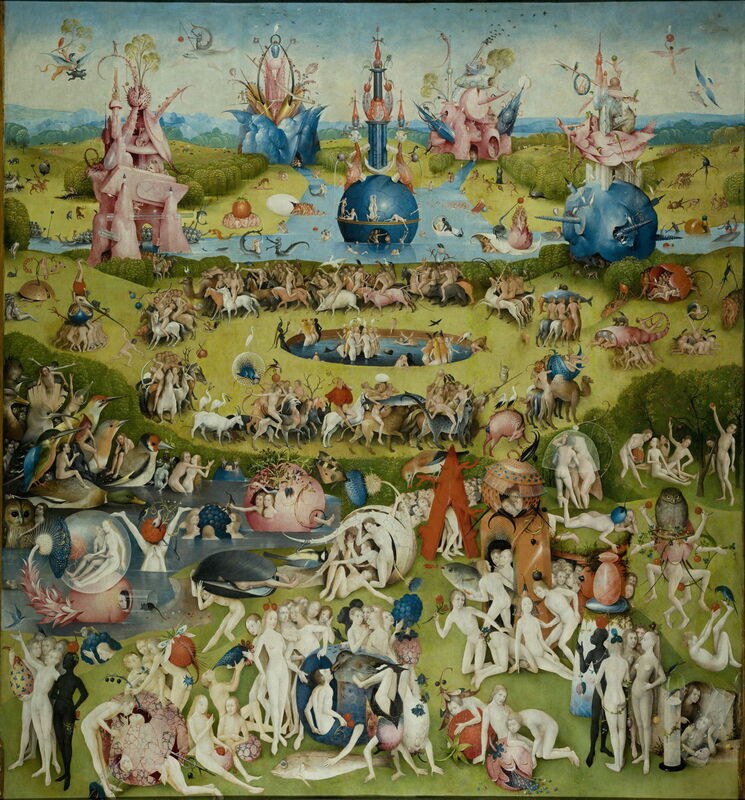 The themes (from the left) are based on creation (the Garden of Eden), pleasure (a pleasure garden), and destruction (the ‘garden’ of hell itself). 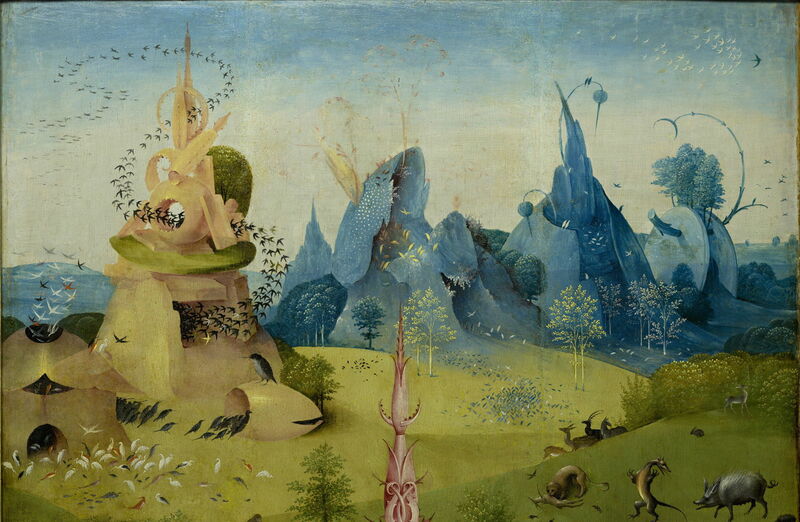 Hieronymus Bosch (c 1450–1516), The Garden of Earthly Delights (exterior) (c 1495-1505), oil on oak panel, central panel 190 × 175 cm, each wing 187.5 × 76.5 cm, Museo Nacional del Prado, Madrid. Wikimedia Commons. 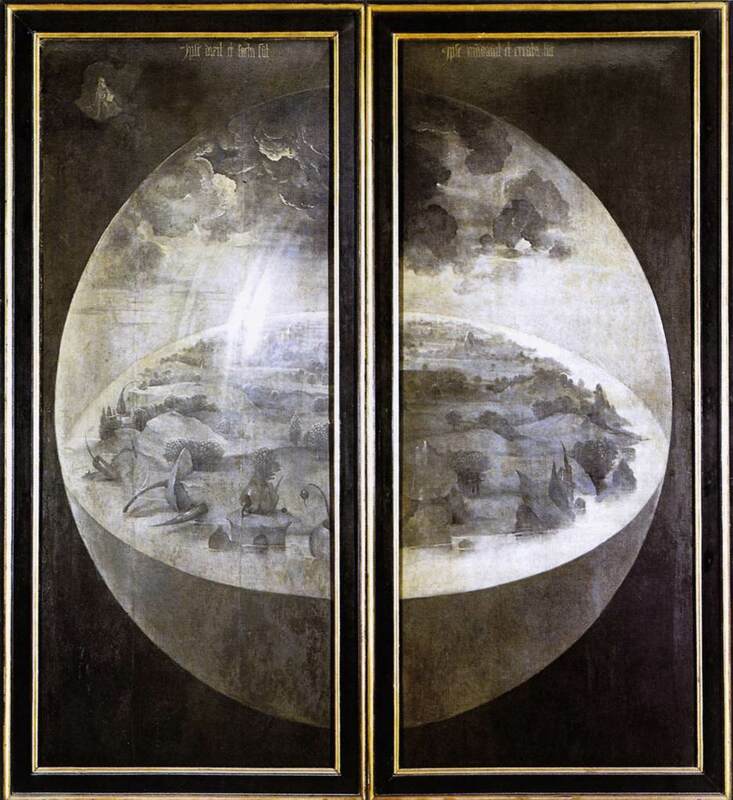 The exterior features a grisaille painting of a portion of the earth within an orb. The surface of that earth is shown at the end of the third day of creation according to the account in Genesis: the land has been separated from water, and plants have started to develop and grow. At the top left is a miniature showing God the Father, apparently based on an engraving in Weltchronik (1493). Opening this restrained and modest cover reveals a heady rush of bright colours, greens, reds, and blues, and a seething mass of detail. The left panel shows an innovative view of the Garden of Eden, which is divided into tiers as it recedes into the background. 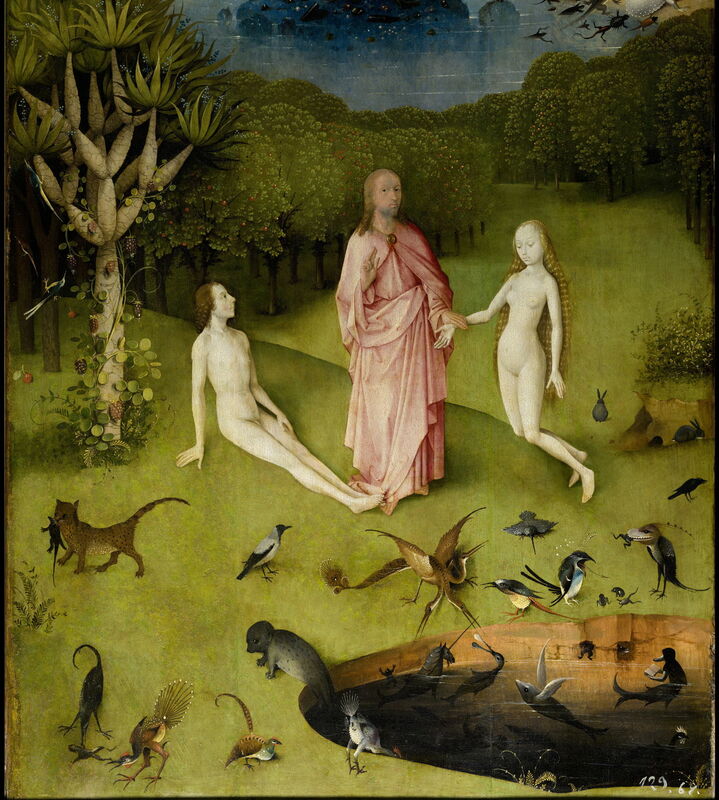 The foreground is dominated by a scene from the account of the creation of man in Genesis, in which God has just created Eve, and introduces Eve to Adam. Adam is seated on the ground on the right hand of God. God holds Eve, on his left, by the right wrist. She appears to be kneeling on the grass on which they are stood. God wears red robes, Adam and Eve are of course naked. Closer to the viewer is a small lake which is teeming with extraordinary fish, other aquatic creatures, birds, and land animals. In all about thirty are shown, few of which resemble earthly species. Behind this foreground is dense woodland, with one tree of strange form prominent at the left, similar to a type of palm. The wood drops down to another lake, in the middle of which is a rocky outcrop containing gems, on which a strange red fountain tower stands. The base of that tower is a sphere, which has a porthole cut out, and an owl peering out from that hole. At the right is a small rock cliff, with an exotic tree growing at the top. This lake has various waterfowl on it, and at the upper left several mammals are drinking; these include a unicorn. Further into the background the land is open grass with scattered trees, and a menagerie of animals including an elephant and a giraffe. At the far (top) left is a complex rock structure from which, and into which, a dense and long flock of swift-like birds are flying. In the far distance to the right is a low but rugged range of rock spires, which are pale blue. The sky is clear, blue, and has many birds in flight. 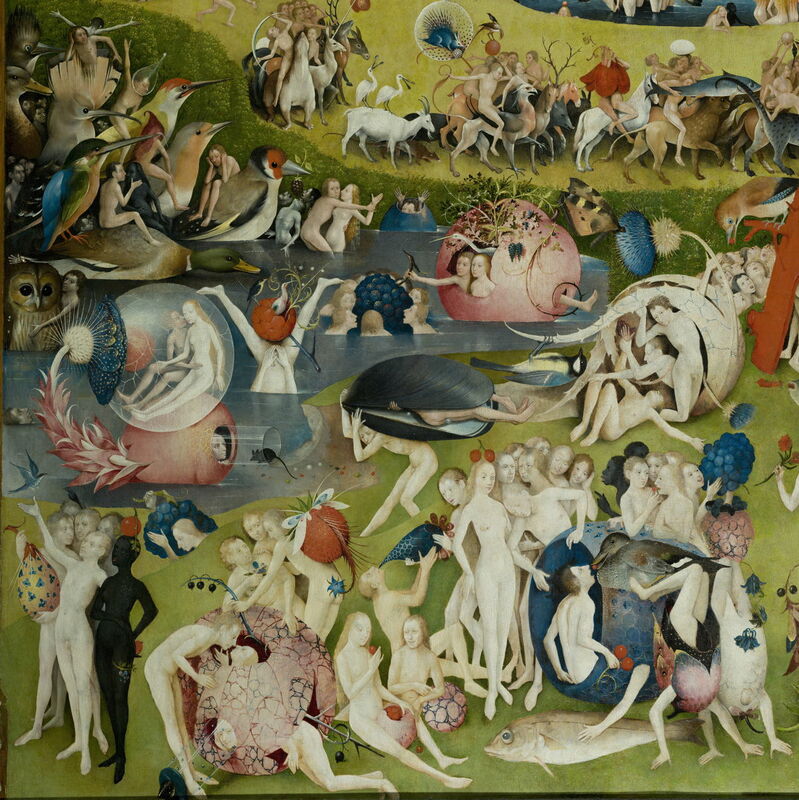 The centre panel shows a rolling deer park with lakes, which is overrun by a dense mass of naked men and women, and bizarre objects. 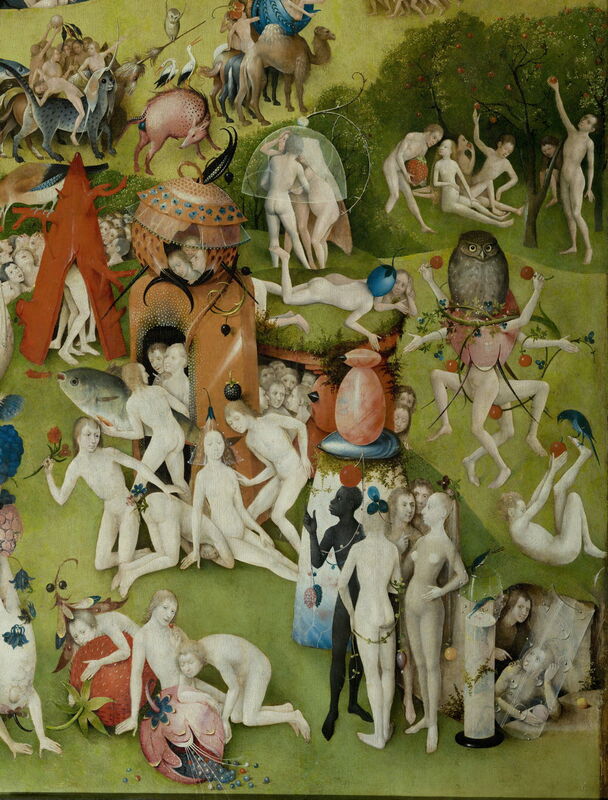 The foreground contains a dense group of people who are frolicking on grass with large fruit objects, including strawberries, blackcurrants, blackberries, apples, cherries, and others. Behind that on the left is a small lake, again densely packed with people and extremely large birds, including a kingfisher. The middle distance is dominated by a central circular pond, in which there are more groups of people. Around them is a procession of people riding horses, camels, and other mammals, in an anticlockwise direction around the central pond. To the left and right are more groups of people interacting, apparently in playful ways, with bizarre objects, such as the tail of a massive lobster. Further into the distance is a larger lake, fed by two rivers leading off into the central distance, and one at each side of the panel. Five fantastic tower structures are by or on the river. The central deep blue tower is based on a sphere, in and on which people are active. The other four towers alternate red and blue in colour, and feature various strange superstructures and ornaments. The two in the far distance, towards the top of the panel, are built over the river. Far beyond is rolling, wooded countryside. The skies above are blue, cloudless, and contain several bizarre flying contraptions. 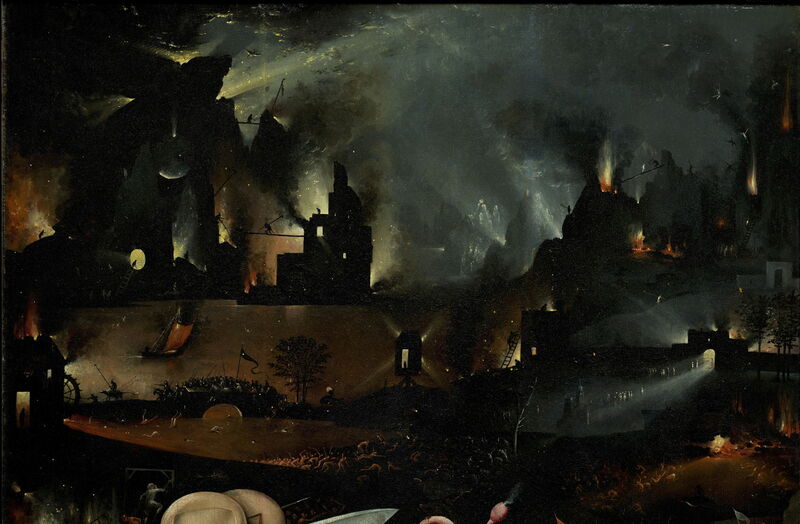 The right panel is a complete contrast to the other two, in showing a nighttime scene full of suffering, violence, and destruction. It is segregated into three tiers by prevailing colour. The foreground, based on mid-browns, shows two substantial groups of naked men and women apparently in torment or violence. The nearer group has playing cards, dice, a backgammon set, and the trappings of gaming and gambling. Behind them is a separate group apparently undergoing torment with very large musical instruments including a lute, harp, and hurdy gurdy. 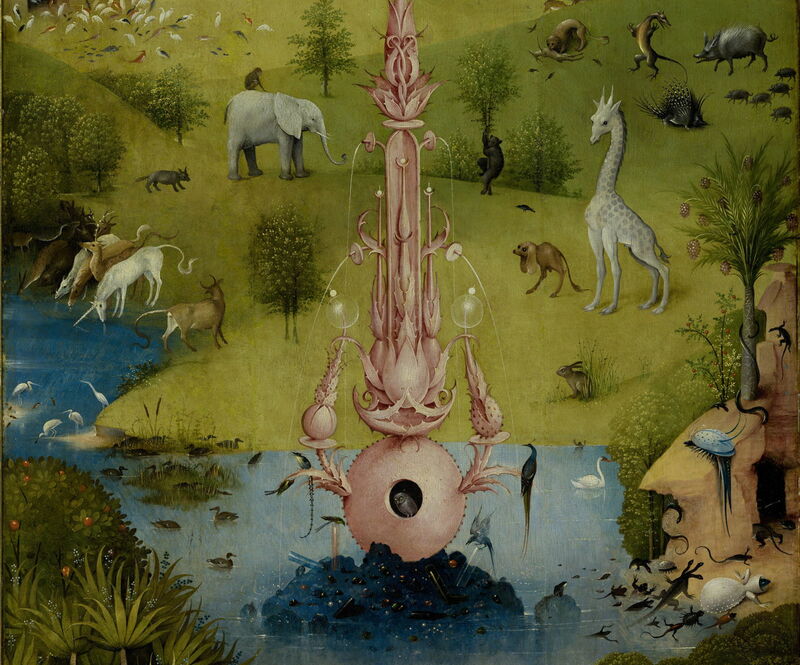 These scenes, on the left, are being overseen by a large bird, sat on an elevated commode. The middle distance changes to dark grey and black. There is a frozen river, and rising up from that is a weird shell similar to the upper torso of a man’s body, and head, with its arms formed from hollow tree trunks resting in small boats. Various people there are being tormented by bizarre portmanteau creatures. The far distance, based on black with red fire and pale yellow shafts of light, is far darker and objects are only made out in silhouette. It shows strife, fire and destruction in the massive buildings of a city. Each of the three panels shows a landscape receding into the background. The prominent features within each panel are composed with informal symmetry within that panel, and across the triptych as a whole. In the left panel, the dominating passages are the foreground figures, centred on God who is in the midline, the red tower in the lake, which is in the midline, and in the distance four pinnacles spread across the skyline. In the centre panel, the round pond in the middle distance is in the midline, and just above the centre of the panel. The five distant towers are arranged symmetrically about the midline, with the central dark blue tower in the midline. The dominant feature of the right panel is the ‘man-tree’ structure, which is in the midline just above the centre of the panel. There are no comparable paintings from the same era, or indeed any period prior to the twentieth century, against which it can reasonably be compared. 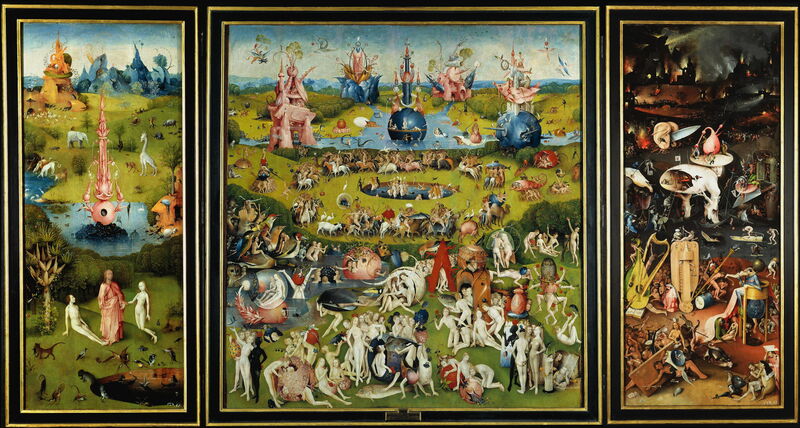 There has never been any serious doubt that this is an authentic work by Bosch’s hand, and its provenance is traced back to 1517, when it was at the Nassau Palace in Brussels. Later that century it moved to Spain, and was presented to the Escorial by Philip II in 1593. Various periods of conservation work have been undertaken, including some retouching and other work to address wear and deterioration in the paint surface. The last major work was undertaken in 1999-2000.